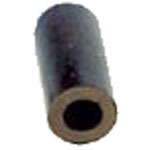 Black rubber post sleeve used on many makes/models. Measures 1-1/16 inches tall, 1/4-inch inner diameter, 7/16-inch outer diameter. Replaces original parts on many Bally, Williams, Data East, and Sega games. Replaces Bally/Williams # 23-6556, 38-6556, Data East / Sega / Stern # 545-5260-00, and similar others. Can be used as a less-expensive substitute for original tapered rubber sleeves on late-model Gottlieb/Premier (# 26648Y & # 30003Y) and Stern Pinball games (# 545-5308-00). Note for Use on Bally/Williams Games: This sleeve is 1-1/16-inches tall. It replaces shorter 1-inch sleeves that were originally used on some Bally and Williams games. The shorter 1-inch sleeve used the same part number, but is no longer being made. This taller post sleeve will sit a bit higher on the post when installed, but will compress down proper height when installed- no need to cut or trim to fit- just install mounting screw/washer (or plastic piece or other hardware) on top of post after sleeve is installed to compress sleeve down to proper height.